Following a heartbreaking game seven loss to the Boston Bruins, the Vancouver Canucks stumbled their way to the President’s Trophy and appear poised for another deep run this year. Unfortunately they’re running into a Kings squad that present a similar challenge that the Bruins did last year. A hot goaltender, an elite defenseman, and a gritty bunch of forwards. Are the Canucks up for the challenge? They should be. Considering the battered Canucks came a game short of the ultimate prize with a defense that was hanging by a thread, and a second line that boasted Chris Higgins and Jeff Tambelini when it mattered most, the improved depth and experience should bode well for the Canucks. David Booth, Zack Kassian, Byron Bitz, and Dale Weise add size and toughness and some skill, while their defense enters the playoffs fairly healthy. The Kings meanwhile return after two disappointing post-season exits where they had the prohibitive favourites on the ropes. In 2010, the Kings were up 2-1 in the series and were leading in Game 4 when Roberto Luongo robbed Alex Frolov on a breakaway that might have been the dagger to Canucks’ nation’s heart. Last season, the Kings were up 4-0 in a pivotal game in the series before collapsing and losing 5-4 in overtime. Rest assured, the Kings will be hungry as well, and have a great goaltender and a strong defensive presence. Their lack of scoring during the regular season is a bit odd considering their personnel, so the Canucks will have to be careful. Roberto Luongo plays well in opening rounds and has been good against Los Angeles, while Jonathan Quick has struggled. Look for the Kings to push the Canucks and potentially upset, but for the Canucks to prevail. · Can Luongo outduel Quick? · Can the Kings score enough to win the series? 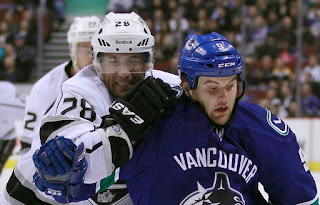 · Will the Canucks power play keep the Kings honest? The Kings will push the Canucks to the limit and could pull off an upset. The Canucks could take a step forward or a step back. Expect the series to be a physical affair that goes 6-7 games. Canucks in 7.